The Wynter chapel length wedding veil is all about capturing the spirit of a timeless wedding. It features sophisticated lines and classic draping. 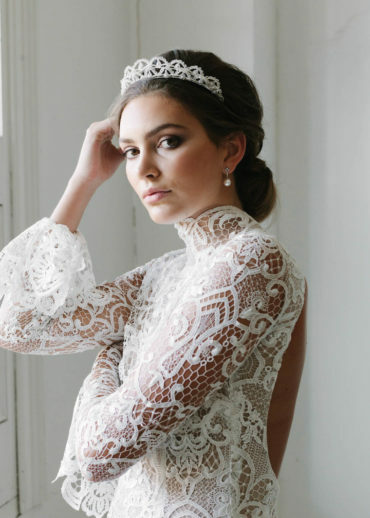 Designed for breezy silhouettes, structured lace gowns and contemporary gowns, either with or without sleeves, this veil evokes effortless romance with feminine appeal. The Wynter veil features gathering at the comb to create subtle volume and an ethereal mood as you walk down the aisle. The straight lines of this veil elongate the silhouette and exude a refined timelessness. Handcrafted from lightweight bridal illusion tulle. Single tier – no blusher layer to pull over your face. Measurements: Chapel length at 230cm. Customisable: Shorter or longer lengths available, including adding a blusher layer. The Wynter wedding veil is ready to ship. Please allow 5-7 business days for production plus delivery times. The Wynter veil is all about classic styling. Its classic cut is flattering and feminine and suits a wide range of wedding gowns. It’s the perfect choice for modern and clean silhouettes, floaty feminine dresses, off-the-shoulder dresses, cropped two-piece ensembles, long sleeves, high necklines, low backs, princess cut dresses. As you can see, Wynter is a versatile veil that can be worn with most bridal silhouettes! This veil is designed to sit at the crown of the head, above or below a bridal updo. We love to style this veil with backwards facing headpieces positioned over the comb for a seamless finish. Our favourite combinations include the Marion, Verse, Botanica, Jasmine and Fontaine headpieces. Browse our full headpiece collection or contact us and we’d be happy to offer a recommendation based on your wedding dress and hairstyle. For a sophisticated look, style this veil with a smaller comb secured to the side of the head. If you prefer an ultra chic regal look, pair the Wynter with a statement crown such as the Blanchett, Rosebury, Harper or Tempest crowns. Our Wynter veil is a chapel length veil that’s designed to create a little puddle on the ground on top of your train. It can be customised to any length to suit you. If you are unsure which length will best suit your wedding dress, please contact us with photos of your wedding dress and height details and we can get back to you with a recommendation. Wynter is handcrafted from a lightweight bridal illusion tulle. It’s available in bridal white or soft ivory tones. We like to aim for a colour match or a shade lighter than your wedding dress.